The justice sector provides citizen avenues to enforce rights and hold government accountable for delivery of public sector services. Within the formal sector, courts and lawyers are the primary providers of justice services. While access to such services can prove complicated for all citizens, poor persons face additional obstacles in accessing due primarily to the inability to pay associated fees. The inability to access courts and lawyers puts the poor at particular disadvantage in a number of circumstances, for example: resolution of intra-family disputes; complaints involving access to social safety nets; and disputes related to employment abuses. Governments can attempt to fill these gaps by introducing new services, such as legal aid and special funds providing payments for alimony or child support, or making existing services more accessible, for example through tools for citizens to represent themselves in court. When targeted properly to the poor, these initiatives can help ensure they are aware of the rules that affect them, and are able to enforce these rules in an efficient and effective manner – an approach recommended by the World Bank as a means to address poverty. Understanding the demands and priorities of poor persons is important to effectively target new services and improve existing ones. Yet in the MNA region understanding of demand is considerably lacking, as is data that would help identify priorities. To better understand demand, the Department of Statistics of Jordan and the Justice Center for Legal Aid (JCLA), a Jordanian civil society organization, developed and implemented a survey of 10,000 households focusing on the justice sector – the first of its kind in Jordan. Its primary objective was to identify the most common types of legal disputes and identify the characteristics of the households and individuals involved in the disputes. Questions on use of services focused on those provided by courts and lawyers. The data obtained covers a number of key issues within the justice sector, including: identifying the most common types of legal cases; access to courts and lawyers in terms of costs and awareness of services provided; access to, and familiarity with, legal aid services; and the economic characteristics of families and individuals with legal disputes. Further disaggregation of data based on monthly expenditure levels and the gender of respondents provides valuable information on the types of issues most affecting the poor and women. The poor and near-poor have considerable need, relative to wealthier individuals, for court and lawyer services but less access. More than two-thirds (68%) of survey respondents reporting an actionable dispute fall into the two lowest categories of expenditure levels, which roughly correspond with the categories of those in poverty and those just above the poverty. The latter group likely falls below the poverty line for certain periods but overall are not classified as poor, and as such are placed in a situation of not qualifying for legal aid services, which are mostly reserved for the poor, but at the same time are not likely to have the financial resources to pay court and lawyer fees. Only 6% of respondents fall into the highest expenditure category. 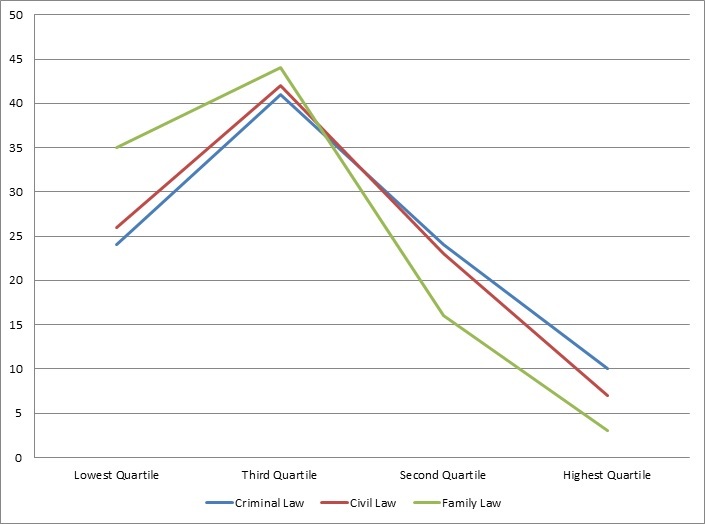 (Figure 1) The increased reporting of disputes by the poor and near-poor, in comparison to wealthier respondents, was consistent along the three categories of disputes – civil, criminal and family law. This data demonstrates the importance of targeting services to the poor and near-poor, and the need to experiment with service delivery models that take into account high demand and the limited resources of a middle income country. Legal aid services – broadly covering information, counseling and representation by a lawyer – are usually reserved for the poor. Tools allowing individuals to represent themselves in court (pro se representation) can benefit the near-poor as well. Poorer persons tend to experience different types of disputes than wealthier ones. Overall, poorer persons form the bulk of respondents affected by family law disputes. This is roughly consistent with global trends, based on provision of legal aid services. 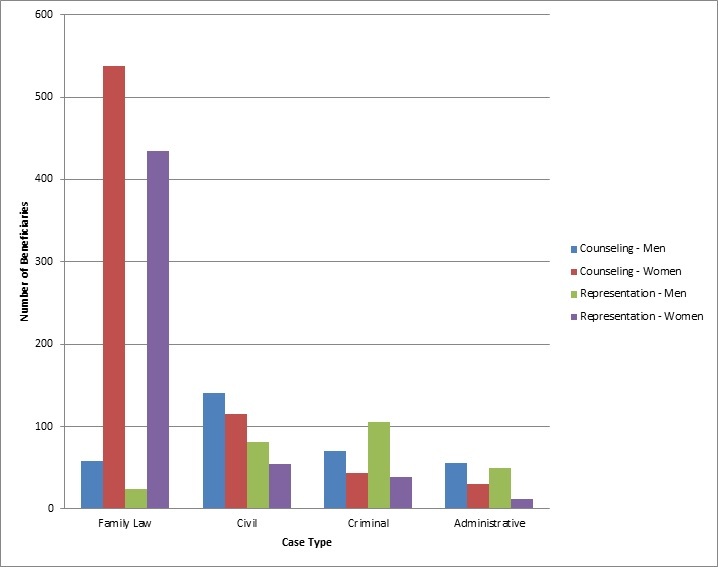 Respondents in the lower expenditure categories were much more likely to be involved in personal family law disputes, such as divorce, alimony, child support, inheritance and access to dowries, than richer respondents – around 80% of those in the lower two expenditure categories versus roughly 20% in the higher two expenditure categories. And within the category of family law, poorer respondents were more likely to be involved in alimony and inheritance cases, and richer ones in cases involving separation/divorce and return of dowries. This finding highlights the ineffective targeting of legal aid services in Jordan, which are obligated only in cases involving serious crimes but are generally not available for family law cases, which are handled by religious courts. Very few Jordanians are aware of the availability of legal aid services, but most would use them if they had the option. Roughly 98% of survey respondents were unaware of existing legal aid services. And ofthe 2% of respondents aware of legal aid, only 17% tried to access it. The primary reasons for not accessing services were lack of knowledge of how to reach service providers (35%), not actually needing services (33%), and complicated procedures for accessing services (27%). On a more positive note, 78% of respondents that sought legal aid services were able to secure them. However, more than 80% of respondents stated they would access courts and lawyers if they received assistance in paying fees. Women’s and men’s use of courts and lawyers also varies. Access to financial resources in addressing disputes is more of a constraint for women than for men, and even more so for female-headed households with women and female-headed households more likely to avoid filing claims in court because of lack of financial resources, and to proceed to court without a lawyer because of inability to pay lawyers’ fees. Women are also more likely to avoid going to court because of social norms (26% of female respondents versus 17% of men), and are perhaps more likely to seek assistance from civil society organizations. While there are no formal restrictions on women accessing court services, anecdotal evidence strongly suggests women face societal pressures to avoid pursuing disputes through formal institutions. At the same time, women may also be more dependent on courts, since they are less likely than men to resolve disputes amicably. Given the unique obstacles they face, women are more negatively impacted by the lack of comprehensive legal aid services. Since the survey suggests that awareness of procedures for accessing courts and lawyers varies little between men and women, the key issue is enhancing mechanisms to use that knowledge. ‘Statistical Survey on the Volume of Demand of Legal Aid Services’, Department of Statistics of the Ministry of Planning and International Cooperation and the Justice Center for Legal Aid (2012). In the pre-crisis period of globalization, the rapid integration of huge emerging market countries such as China and India into the world economy led to high demand in global food and energy markets. The depreciation of the US-dollar caused further upward pressure: While international prices are often denominated in dollar, many producers calculate the price in their own currency. 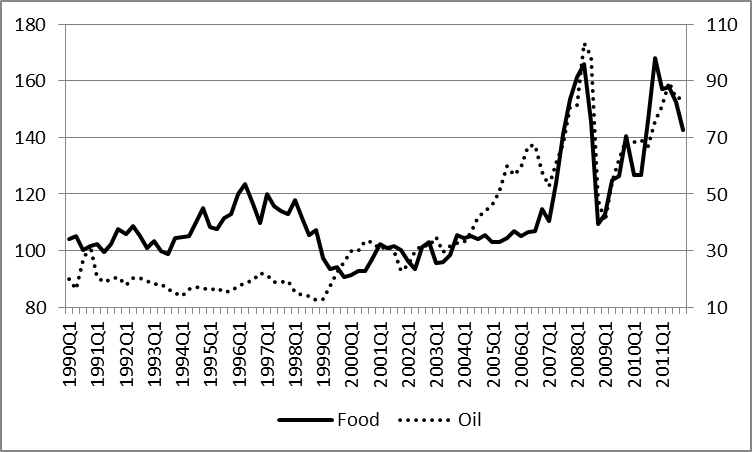 Oil and food prices have moved in parallel in recent years (Figure 1). This pattern is probably also driven by legislative mandates to use cropland for the production of biofuels and the increasing role of commodities in international asset portfolios. While the global financial crisis led to a decline in the world demand for commodities, causing oil and food prices to fall, they started to rise again thereafter. Note: IHS Global Insight (oil, dashed line, right axis), Food and Agriculture Organization of the United Nations (food, solid line, left axis). Rocketing oil and food prices can affect the real side of the economy, depending on the degree of their transmission to the domestic price level. Price increases may depress the purchasing power of private households and can trigger production losses, as firms will choose labour and capital input to match the shifts in relative prices. In the case of price decreases, a reversal is expected, given that the adjustment pattern is symmetric. The effects should be especially visible in low-income net importing countries. As food represents a relatively large share of the consumption baskets of private households, accelerating prices can lead to increasing poverty and political instability. For instance, high and volatile food prices might have contributed to social unrest in the eve of the Arab Spring. The transmission of oil and food prices to consumer prices is at the centre of our paper. The degree of price transmission can differ across countries, depending on whether own resources can be mobilized to mitigate the effects. Policy responses may also shape the outcome. In case of price hikes, governments can react by rising subsidies or improved safety nets to protect poor households. Export restrictions might be implemented to stimulate supply at domestic markets. Wage-price spirals may occur in countries with wage and price indexation. To combat the rising inflation pressure, central banks may tighten their monetary policy stance, but with adverse effects on the real economy. Countries with international reserves may react by appreciating their currencies. However, an appreciation hurts firms engaged in export-oriented activities and hampers the build-up of import-competing industries. While such policies could dampen the adverse effects of food and oil price shocks, they can contribute to higher instability in international markets and decrease the incentives of domestic farmers to respond with higher production. In addition, policies are not sustainable, if they imply a deterioration of public budgets. In a recent study, we have studied the impacts of global food and oil prices on consumer prices for a sample of MENA countries: Algeria, Egypt, Jordan, Libya, Morocco, Syria and Tunisia. The selection is motivated by data availability. All countries are net food importers. Due to strong population growth, the vulnerabilities will likely increase in the future. The region is the most food import dependent region in the world. Food dependency ratios, i.e. net imports over private consumption exceed 50 percent on average. As the analysis shows, exchange rate movements act as shock absorbers only partially. Estimated food price elasticities are about twice as large as the oil price elasticities. Hence, the impacts of food prices on national consumer prices dominate. The response of real GDP seems to be very limited both in the long and short run. We found also asymmetries in the relationship, i.e. a lower reaction of domestic consumer prices after negative shocks in international prices. This points to the existence of rigidities to downward price adjustments. These rigidities might have been reinforced by extended price subsidies in many countries. In fact, energy and food subsidies have been used for decades and constitute the major part of the social security safety net in the region. According to the IMF, food subsidies were about 0.7 percent of MENA GDP in 2011. Energy subsidies amounted to $240 billion, which is about 8.5 percent of overall GDP or 22 percent of the government revenues. Furthermore, the region holds more than 13 percent of global wheat stocks. Despite some failures, the strategic food reserves could insulate the region from off-shore price disturbances. On the other hand, subsidies can also increase instability in international markets, as the incentives to food producers are distorted. By comparing the adjustment pattern across countries, our analysis provides an indirect evaluation of the success of policies implemented to cushion the domestic economies from global price shocks. In this vein, we feel legitimized to consider government interventions to be just another characteristic affecting the pass-through to national inflation. It is supposed that a country should generate sufficient foreign exchange from exports to finance food imports in order to be food secure. Keeping prices and imports of food as stable as possible is achieved not only by importing enough food, but also by interventions based on food reserves and price subsidies. These practices will cost even more in case of global price shocks. For instance, the government will have to double the subsidy paid per unit of imported food in case of a shock doubling the world food price in order to keep imports at levels prevailing at the old international prices. Regardless of the assumption that food and oil prices fluctuate simultaneously, MENA oil-exporting countries, such as Algeria and the Gulf Council countries, should benefit on the macro level in case of rising oil prices, having more fiscal space to cover food imports and the costs of interventions. The situation in the oil-importing countries will differ and its fiscal capacity will depend on other factors as well, including its relations with the region and the outer world through remittances and trade. Published under the same title in the Journal of Developing Areas, volume 48, issue 3, pp. 339-352, 2014. The past decades have seen a marked increase in the inflow of foreign migrant domestic workers from South Asia, Southeast Asia, and East Africa to the Middle East region driven by a strong demand for affordable domestic help. According to the latest statistics by the International Labour Organization (ILO), the number of foreign domestic workers stood at 53 million around the world in 2013. In the Middle East, their number amounted to 1.4 million. As a matter of fact, the Middle East has attracted a great deal of attention regarding the adverse employment conditions of foreign domestic workers originating from low-income countries. This study examines the determinants of the demand for foreign domestic workers in Lebanon, which is a middle income country. In such countries, foreign domestic workers’ employment is an important economic activity delivering significant market and non-market services. First, foreign domestic workers provide care services for dependents living in the household. Second, the presence of these workers in the household may play a crucial role in determining the female labor force participation decisions in the destination country. Third, the ease of access to foreign domestic workers in the destination country provides low cost domestic labor, which allows more middle-class households to have access to domestic work services. This is in contrast to rich countries where the cost of hiring domestic workers is high and the demand is limited to wealthy households. Our study provides new evidence on the demand for foreign domestic work. It is the first attempt aimed at identifying factors that affect the demand for foreign domestic workers in the Middle East. We use a nationally representative sample of all Lebanese households drawn from the National Household Budget Survey (2005). The sample includes 7,431 Lebanese households distributed across all 6 governorates of Lebanon. We consider a set of explanatory variables related to the socio-economic characteristics of households, the characteristics of the household head, and the dwelling characteristics. Contrary to popular beliefs, we find that the size of the household and the presence of elderly persons are not important determinants of the hiring decision of foreign domestic workers, while the probability of hiring a domestic worker is significantly higher for households with children and disabled persons. This result is in line with well-established evidence in the sociology literature that indicates that downward solidarity (from parents to children) is stronger than upward solidarity (from children to parents). The likelihood of hiring a domestic worker is also increasing in the level of educational attainment of the household head. This finding is in line with the theory of human capital predicting that the level of education is inversely related to the time allocated to household tasks. Interestingly, we find that the number of rooms in the residence rather than its total surface area or type to be the only relevant dwelling characteristic. In fact, in Lebanon most foreign domestic workers reside with their employers, which explains why dwellings -after controlling for size- with more rooms are more likely to have a domestic worker. Finally, our results show that the two most rural and poorest governorates are associated with the strongest negative and significant regional effect on the likelihood of employing a foreign domestic helper. Important policy implications transpire from our study. Our results highlight the need for increased public investments in care provision in order to provide households with a choice between private and public institutional care, especially for households with children or persons with special needs. Furthermore, it is shown that the trade-off between institutional care and care provided by foreign domestic workers can be more severe in rural areas. Therefore, we suggest several possible solutions, such as reducing the costs of hiring foreign workers in rural areas to provide a short-term substitute for the absence for institutional health care in those areas that lack the adequate infrastructure. Our results also make it possible to speculate about the future demand for domestic workers. At the current trend, smaller households are less likely to hire domestic help yet households with higher educational attainment will be doing the opposite. Such factors make it difficult to predict the final impact of socio-economic trends on the future demand for foreign domestic workers in Lebanon.